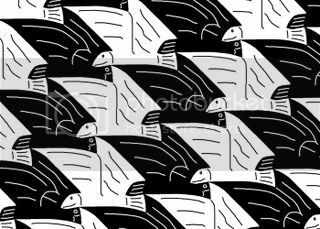 This is a detail copied from a print by Dutch artist M.C.Escher. It's an interlocking pattern of the weird shapes of a fish and a bird. Looks like a complicated creation, doesn't it? Yet you can also see it a regular pattern of diamond shaped polygons (or trapeziums). And there are two basic patterns: one dominated by the black fish pattern, and the other dominated by the image of the white bird (or is it a fish with wings?). Each of these patterns can be thought of as a tile; the complete images of the bird or fish are formed only when the tiles are placed next to each other. The effect of arranging these tiles together is shown here. 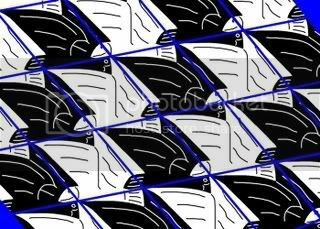 This process is called tiling, or tessellation.